Zimbabwe's government has promised to dig out and rebury the bodies of thousands of people killed during a 1980s military campaign aimed at dissidents, state media reported Wednesday. 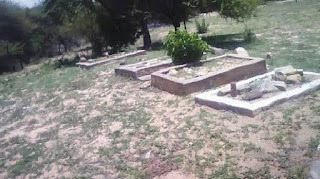 Graves are seen at a monument built at the site of disused Bhalagwe barracks, Matabeleland. A 1997 report by the Catholic Commission on Peace and Justice, drawing on more than 1,000 interviews, said 10,000 to 20,000 civilians were killed by security forces under the rule of then-leader Robert Mugabe in what has become known as the Gukurahundi massacres. Their bodies were stuffed down mine shafts and buried in mass graves. Many believe the government has done too little to bring closure to families. There have been no prosecutions and no public apology. The government has promised it will assist people whose parents died in the campaign to get proper identity documents, as well as medical help for those injured. Among the promised also made by government is the "protection mechanisms for those affected by Gukurahundi to be free to discuss their experiences." Before now several people were arrested for discussing the killings in public while artworks depicting the era were banned from public view. Earlier in 2011, hundreds of bodies have been found in a mass grave in the Mount Darwin area in northern Zimbabwe, and at another site near the Monkey William Mine in Mt. Darwin district, which triggered the inquiry of Amnesty International at that time who believed the exhumations require professional forensic expertise to enable adequate identification, determination of the cause of death and criminal investigations. "The Zimbabwe government must ensure that exhumations are professionally conducted according to international standards to properly establish the cause of death, ensure proper identification and, where possible, to return remains to family members," said Michelle Kagari, Amnesty International's deputy director for Africa. "If the Zimbabwe government does not have the capacity to undertake the digging properly it must ask for international co-operation and assistance to ensure that forensic experts can undertake the exhumations."